Kakteen Südamerika 3: 916 (1980). 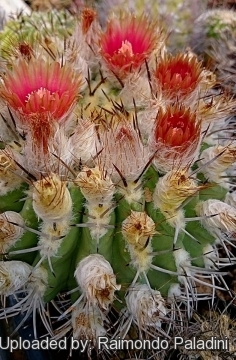 Eriosyce rodentiophila fleischeriana, (ex Cactus Flowers Rumst). Origin and Habitat: Chile, Cifuncho, 200 m.
Description: Eriosyce rodentiophila subs. fleischeriana|SN|14947]] published in Kníže Catalogue n.n. (name not validly published) is a local or morphological form of Eriosyce rodentiophila. It is very similar to the standard species and not easily separable by any important character from the other rodentiophila. The spines take a grey-brown colouring with time. 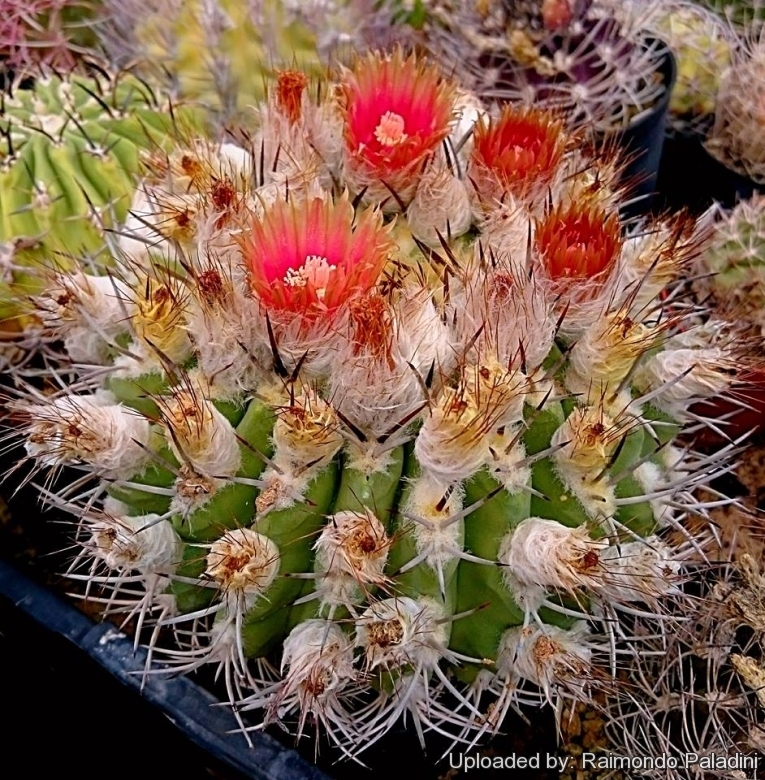 Habit: It is a solitary (never clustered) barrel shaped cactus. Stem: Globose to shortly columnar with time, 12-32 cm in diameter, with stem apex covered by white wool. Roots: Fibrous, produced from short tuberous root. Ribs: 18-35, obtuse, strongly notched to form tubercles. Spines: Numerous, thick, curved upwards, dull ivory to horn coloured, becoming grey. Central spines: 4-8,30-50 mm long. Radial spines: 12-15,20-30 mm long. Flowers: Borne on older areoles at the woolly top of the plant, campanulate, cream coloured or reddish, 2,5-4 cm long, 2.2-3 cm in diameter; pericarpels and floral tubes covered by white wool and with stiff bristles. Fruits: Very different from those of Eriosyce aurata, with a fleshy, juicy and acid wall, reddish yellow, 25-30 mm long, covered with few white wool and not dehiscent. 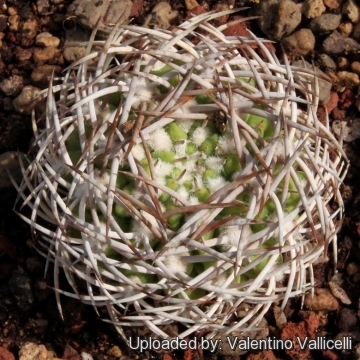 (Eriosyce rodentiophila is the only Eriosyce with fruits that do not split open! On the contrary Eriosyce aurata fruits are thin-walled, heavily woolly green and dehiscing from a basal pore). Eriosyce megacarpa F.Ritter: Differs for larger larger fruit. Distribution: south of Chañaral. 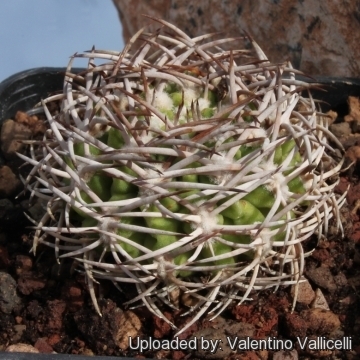 Eriosyce rodentiophila F.Ritter: is a solitary (never clustered) barrel shaped cactus, with stem apex covered by white wool. Spines thick, curved upwards, dull ivory to horn coloured, becoming grey. Distribution: north of Taltal south to below Chanaral. Eriosyce rodentiophila subs. fleischeriana (Kníže): is very similar to the standard species and not easily separable by any important character from the other rodentiophila. Distribution: Cifuncho. Eriosyce rodentiophila var. 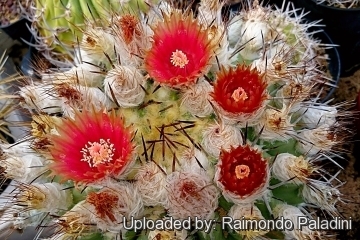 lanata F.Ritter: Areoles more woolly. Fruit slightly smaller, yellow or orange, not red. Seed slightly smaller. Distribution: between Cifuncho Esmeralda and along the coast. Cultivation and Propagation: It is a very slow growing and extremely rot prone species if kept in a non ventilated place. Soils: Require a very fast mineral draining drying soil (70-80% grit and 20-30% of land soil). Watering Needs: Extremely root prone, needs good drainage, waterings should be rather infrequent in summer (do not overwater), to keep the plant compact and not become excessively elongated and unnatural in appearance. Keep dry in winter, or when night temperatures remain below 10° C.
Exposure: Requires strong sun exposure to develop good spinal growth (maximum brightness, sunlight accepted), but tolerate light shade. Hardiness: Good heat tolerance. Hardy to at least -5°C for a short period but cannot tolerate long standing freezing temperature, and for an healthy cultivation ensure a minimum temperature of 5° C. Assure a good ventilation. USDA Hardiness Zone 9b and 11. Propagation: Usually propagated from Seeds. (seldom produces offsets). Contrary to what is often observed with the seeds of Eriosyce aurata, seeds of Eriosyce rodentiophila germinate readily with good yields. The seedling growth is rapid. But the seedling are often grafted because the plants on their own roots (especially the bigger ones) are extremely prone to root rot. In fact the best and older specimens are the grafted ones.